Apertura al pubblico fino al 27 novembre 2011 con gli orari di apertura del Museo. 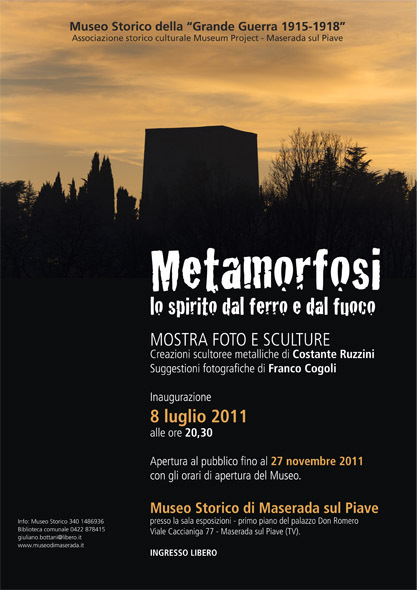 La mostra prevede l’esposizione delle creazioni scultoree metalliche dell’artista Costante “Tino” Ruzzini, eseguite con frammenti di materiale di natura bellica deflagrata e delle suggestive espressioni fotografiche di Franco Cogoli, fotoreporter. Con i lavori presentati, i due artisti raccontano la loro ricerca della spiritualità con quanto lasciato dalla Grande Guerra, il primo cercando di liberarla dalla natura truce del materiale utilizzato, il secondo esaltando le forme dei luoghi creati dall’effetto negativo di quegli stessi materiali. Il titolo che abbiamo scelto diventa emblematico nell’insieme e riassume la complessità di questa ennesima sfida che abbiamo raccolto e che vogliamo rilanciare per far conoscere sempre nuovi ed affascinanti aspetti legati alla Grande Guerra assume la complessità di questa ennesima sfida che abbiamo raccolto e che vogliamo rilanciare per far conoscere sempre nuovi ed affascinanti aspetti legati alla Grande Guerra. Nasce a Colfosco il 27 gennaio 1947 e a sei anni è vittima di un grave incidente provocato dall’esplosione di un residuato bellico della Grande Guerra. A causa di ciò trascorre il primo periodo della sua giovinezza nel collegio Mutilatini presso la Villa Topo-Florio di Butrio dove dopo il normale ciclo scolastico frequenta un corso di tipografia. Questo primo approccio, non diretto ma parallelo, legato all’arte lo traghetterà verso quel mondo che non conosce ancora profondamente ma a cui istintivamente sente di appartenere. Amante della sua terra, legato a filo doppio a quelle che sono state le vicissitudine che l’hanno segnata, ricerca lungo il corso del Piave e sui colli della sua infanzia le tracce lasciate da quanti ne hanno scritto la storia. Nelle arti plastiche trova la sua dimensione artistica, ricercando nella combinazione delle forme, l’intrinseco narrato dalla materia. La ricerca è sofferenza e l’utilizzo espressivo del materiale deflagrato ne è un esempio tangibile. Interpreta e racconta “i segni” lasciando al freddo acciaio tutto il ruolo del suo dramma. Ciao, sono Franco Cogoli, fotografo di viaggi; collaboro con alcuni mensili di settore, come Bell’Italia, Bell’Europa, InViaggio etc .Ai classici reportages affianco il settore enogastronomico e curo fra l’altro, assieme alla giornalista Auretta Monesi, una rubrica per il mensile Bell’Italia. Collaboro con l’agenzia fotografica Simephoto che rappresenta parte del mio lavoro in tutto il mondo, e con Sime Edizioni contribuisco alla realizzazione di alcuni libri. Conservo un interesse speciale per la mia regione, il Veneto, cui dedico un archivio di immagini per l’editoria di viaggio.Voglio ringraziare il Direttore del Museo, Giuliano Bottani, per avermi regalato, oltre alla sua amicizia, la possibilità di contribuire a questo, per me sentito, evento. This entry was posted in Eventi 2011. Bookmark the permalink. I simply want to mention I’m very new to weblog and actually savored this web site. Likely I’m going to bookmark your blog . You actually have really good posts. Thank you for sharing with us your web site. I just want to mention I’m new to blogging and really savored you’re page. Probably I’m want to bookmark your website . You definitely have impressive articles. Many thanks for sharing your website page. I just want to say I’m new to weblog and truly enjoyed you’re blog. Most likely I’m likely to bookmark your site . You certainly come with awesome posts. Regards for sharing your website page. I just want to mention I’m newbie to weblog and certainly loved you’re web site. Probably I’m going to bookmark your site . You absolutely have excellent articles and reviews. Regards for sharing your web page. I simply want to tell you that I am all new to weblog and honestly savored this blog. Likely I’m want to bookmark your website . You certainly come with outstanding well written articles. Thanks a lot for revealing your webpage. I just want to mention I’m beginner to weblog and actually savored this web site. More than likely I’m want to bookmark your site . You absolutely come with superb stories. Appreciate it for revealing your web page. I just want to tell you that I am just all new to weblog and honestly savored you’re blog site. More than likely I’m likely to bookmark your site . You really come with fantastic posts. Regards for revealing your blog site. I just want to mention I am new to blogging and certainly liked this web page. Very likely I’m want to bookmark your site . You really have incredible well written articles. Bless you for sharing your website. I just want to say I’m newbie to blogs and truly savored this web blog. Almost certainly I’m planning to bookmark your blog post . You certainly have beneficial articles and reviews. Appreciate it for sharing with us your web site. I just want to say I am newbie to weblog and really enjoyed this web-site. Almost certainly I’m want to bookmark your blog post . You actually have excellent posts. Thanks for sharing your website. I simply want to tell you that I’m newbie to blogging and really liked you’re web page. Probably I’m going to bookmark your blog . You absolutely come with incredible articles and reviews. Many thanks for sharing your web page. I simply want to mention I am just new to blogging and certainly savored your page. More than likely I’m want to bookmark your blog . You surely have beneficial article content. Thanks for sharing your web page. It’s perfect time to make some plans for the future and it’s time to be happy. I have read this post and if I could I want to suggest you some interesting things or tips. Perhaps you can write next articles referring to this article. I want to read more things about it! Fantastic goods from you, man. I’ve understand your stuff previous to and you are just extremely great. I really like what you’ve acquired here, certainly like what you’re saying and the way in which you say it. You make it entertaining and you still care for to keep it wise. I cant wait to read much more from you. This is really a wonderful web site. Excellent read, I just passed this onto a friend who was doing a little research on that. And he actually bought me lunch since I found it for him smile So let me rephrase that: Thanks for lunch! “Bill Dickey is learning me his experience.” by Lawrence Peter Berra. I like the helpful information you provide in your articles. I will bookmark your weblog and check again here frequently. I am quite certain I will learn many new stuff right here! Good luck for the next! leaflet distribution the only answer. What i don’t understood is if truth be told how you are now not really a lot more neatly-preferred than you may be now. You are so intelligent. You recognize thus considerably when it comes to this subject, made me in my view imagine it from numerous various angles. Its like men and women are not interested unless it¡¦s one thing to accomplish with Woman gaga! Your personal stuffs outstanding. All the time handle it up! Hi there, just became alert to your blog through Google, and found that it is really informative. I’m going to watch out for brussels. I will appreciate if you continue this in future. Lots of people will be benefited from your writing. Cheers! Good site! I truly love how it is easy on my eyes and the data are well written. I’m wondering how I might be notified whenever a new post has been made. I’ve subscribed to your RSS feed which must do the trick! Have a nice day! Thank you so much for giving everyone an extraordinarily breathtaking opportunity to read in detail from this web site. It really is so great and as well , jam-packed with a great time for me and my office acquaintances to visit your website not less than thrice in a week to learn the newest guidance you will have. Of course, I’m also usually satisfied with your awesome pointers served by you. Certain 4 areas on this page are completely the simplest we have all had. Very efficiently written post. It will be beneficial to anyone who usess it, as well as me. Keep up the good work – can’r wait to read more posts. wonderful points altogether, you just received a brand new reader. What may you recommend in regards to your submit that you made a few days in the past? Any certain? hey there and thank you for your info – I’ve certainly picked up something new from right here. I did however expertise a few technical issues using this site, as I experienced to reload the site lots of times previous to I could get it to load properly. I had been wondering if your hosting is OK? Not that I am complaining, but slow loading instances times will often affect your placement in google and could damage your high quality score if advertising and marketing with Adwords. Well I am adding this RSS to my email and could look out for a lot more of your respective exciting content. Make sure you update this again soon..
I’ve been absent for a while, but now I remember why I used to love this web site. Thanks , I¡¦ll try and check back more frequently. How frequently you update your website? Iâ€™ve been exploring for slightly for any high quality articles or blog posts on this kind of area . Exploring in Yahoo I at last stumbled upon this internet site. Reading this information So iâ€™m pleased to convey that Iâ€™ve a really good uncanny feeling I discovered just what I needed. I most certainly will make confident to donâ€™t forget this site and give it a look regularly. Hi, Neat post. There’s an issue with your web site in web explorer, may test this¡K IE nonetheless is the market chief and a big part of other folks will pass over your excellent writing due to this problem. Just wish to say your article is as astounding. The clarity on your post is simply nice and that i can assume you’re knowledgeable in this subject. Well with your permission allow me to seize your feed to stay updated with forthcoming post. Thank you a million and please carry on the enjoyable work. I truly wanted to develop a small comment to appreciate you for those fantastic concepts you are posting on this site. My time-consuming internet lookup has at the end been paid with excellent facts and strategies to talk about with my friends and classmates. I would point out that most of us website visitors are very much blessed to exist in a great place with many special people with great tips. I feel very much blessed to have discovered your weblog and look forward to plenty of more fabulous minutes reading here. Thank you once more for all the details. whoah this blog is magnificent i love studying your posts. Stay up the great paintings! You already know, lots of individuals are searching round for this info, you could help them greatly. Thanks for helping out, excellent information. “You must do the things you think you cannot do.” by Eleanor Roosevelt. Kupujemy najlepsze kawy i herbaty !!! This web page is often a walk-through its the internet you wanted about this and didnâ€™t know who to question. Glimpse here, and you will completely discover it. Hey there, I feel your blog may be having browser compatibility issues. When I look at your website in Safari, it looks fine but when opening in Internet Explorer, it has some overlapping. I just wanted to give you a quick heads up! Other then that, superb blog! I realized more new stuff on this weight loss issue. Just one issue is a good nutrition is extremely vital whenever dieting. A tremendous reduction in fast foods, sugary foods, fried foods, sweet foods, pork, and whitened flour products could possibly be necessary. Having wastes harmful bacteria, and poisons may prevent ambitions for losing weight. While a number of drugs briefly solve the challenge, the nasty side effects usually are not worth it, they usually never offer more than a temporary solution. This can be a known indisputable fact that 95 of diet plans fail. Thanks for sharing your opinions on this site. Hello! I just wish to give an enormous thumbs up for the good details you might have correct here on this post. I can be coming again to your blog for much more soon. Outstanding read, I just passed this onto a colleague who was doing just a little research on that. And he actually bought me lunch because I located it for him smile So let me rephrase that. I beloved as a lot as you’ll receive carried out correct here. The comic strip is attractive, your authored subject matter stylish. nevertheless, you command get got an shakiness more than that you would like be delivering the following. unwell undoubtedly come further beforehand once much more since precisely the comparable almost a lot steadily within case you protect this hike. What a lovely weblog. I will surely be back once more. Please maintain writing! It’s really a nice and helpful piece of information. I am happy that you just shared this useful information with us. Please stay us informed like this. Thank you for sharing. There is visibly a bunch to know about this. I believe you produced various good points in functions also. You ought to take part in a contest for among the most effective blogs on the internet. I will suggest this internet site! Thanks for the writeup. I undoubtedly agree with what that you are saying. I’ve been talking about this subject a whole lot lately with my father so hopefully this will get him to see my point of view. Fingers crossed! Hi, you have post here a very valuable details for every person who looking to learn more details on this subject. I read it with most enjoyment and believe that everyone can apply it for their very own use. Thank you for valuable post. Looking to read much more from you. Wow! This blog looks just like my old one! It’s on a completely different topic but it has pretty much the same page layout and design. Outstanding choice of colors! Hello gentleman do youâ€™ve got new links ? I enjoy article evolve for my friend â€˜ ..
omg! canâ€™t picture how fast time pass, soon after August, ber months time already and Setempber is the first Christmas season in my location, I genuinely adore it! Good post. I learn something more challenging on different blogs everyday. It’s going to always be stimulating to read content from different writers and follow just a little one thing from their store. I’d choose to make use of some with the content on my blog whether you don’t mind. Natually I’ll give you a hyperlink in your net blog. Thanks for sharing. There is certainly a lot to learn about this subject. I really like all of the points you have made. Do you mind if I quote a few of your articles as long as I provide credit and sources back to your site? My website is in the very same niche as yours and my visitors would really benefit from some of the information you provide here. Please let me know if this ok with you. Thanks! I have observed that service fees for on-line degree pros tend to be an incredible value. For instance a full Bachelors Degree in Communication from The University of Phoenix Online consists of 60 credits at $515/credit or $30,900. Also American Intercontinental University Online makes available Bachelors of Business Administration with a total program requirement of 180 units and a tariff of $30,560. Online degree learning has made getting your degree far less difficult because you might earn your own degree from the comfort of your house and when you finish from office. Thanks for all the tips I have really learned through your website. Hello very cool site!! Man .. Excellent .. Amazing .. I’ll bookmark your web site and take the feeds additionally…I am satisfied to search out so many helpful info right here within the submit, we want work out extra techniques on this regard, thank you for sharing. Our potent immediate downline consist of incredibly knowledgeable website fashion stylists make an attempt to deliver position focused service providers. They attempt to gain and consequently attain great online pages that can help members to raise their brand-name on the net in the strongest and as a consequence proficient way. Hi there. I discovered your website via Google at the same time as looking for a similar topic, your web site came up. It seems great. I’ve bookmarked it in my google bookmarks to come back then. Thanks for your post. One other thing is when you are marketing your property alone, one of the issues you need to be aware of upfront is how to deal with home inspection reviews. As a FSBO vendor, the key towards successfully shifting your property as well as saving money with real estate agent commission rates is knowledge. The more you recognize, the softer your property sales effort might be. One area when this is particularly critical is information about home inspections. A topic close to my heart numerous thanks, i’ve been thinking about about this subject for some time. Hiya, I am really glad I have found this information. Today bloggers publish just about gossip and internet stuff and this is actually frustrating. A good site with exciting content, this is what I need. Thanks for making this website, and I’ll be visiting again. Do you do newsletters by email? Attractive section of content. I just stumbled upon your weblog and in accession capital to assert that I acquire actually enjoyed account your blog posts. Any way I’ll be subscribing to your augment and even I achievement you access consistently rapidly. Thanks a lot for sharing this with all people you actually recognise what you’re speaking approximately! Bookmarked. Please also discuss with my website =). We may have a hyperlink alternate contract among us! I beloved as considerably as you are going to receive carried out correct here. The comic strip is attractive, your authored subject matter stylish. nevertheless, you command get got an shakiness over that you would like be delivering the following. unwell undoubtedly come further beforehand once more since precisely the comparable practically a whole lot steadily within case you protect this hike. Hiya, I’m really glad I’ve found this info. Today bloggers publish just about gossip and internet stuff and this is really frustrating. A good site with exciting content, this is what I need. Thanks for making this site, and I’ll be visiting again. Do you do newsletters by email? Thanks for every other wonderful article. Where else may anyone get that kind of info in such an ideal approach of writing? I’ve a presentation subsequent week, and I’m on the look for such information. Just wish to say your article is as amazing. The clarity in your post is just great and i can assume you are an expert on this subject. Fine with your permission let me to grab your RSS feed to keep up to date with forthcoming post. Thanks a million and please keep up the enjoyable work. Thanks , I’ve just been searching for info approximately this topic for a while and yours is the best I’ve came upon till now. But, what about the conclusion? Are you positive about the supply? Very efficiently written post. It will be valuable to anyone who usess it, as well as myself. Keep doing what you are doing – i will definitely read more posts. Thanks for your article on this blog. From my own experience, there are occassions when softening way up a photograph may well provide the photographer with a little an imaginative flare. Many times however, the soft blur isn’t just what you had in mind and can quite often spoil an otherwise good image, especially if you consider enlarging it. I enjoy you because of every one of your labor on this blog. Kate takes pleasure in going through research and it is simple to grasp why. Almost all learn all concerning the compelling ways you present good guidance on the website and therefore attract contribution from website visitors about this concern while our girl has been learning a lot. Take advantage of the remaining portion of the new year. You are conducting a powerful job. I am always invstigating online for ideas that can benefit me. Thank you! Attractive section of content. I just stumbled upon your weblog and in accession capital to assert that I acquire in fact enjoyed account your blog posts. Any way I’ll be subscribing to your feeds and even I achievement you access consistently rapidly. Somebody necessarily help to make significantly posts I might state. That is the very first time I frequented your web page and to this point? I surprised with the research you made to make this actual publish extraordinary. Excellent job! I’m not sure where you are getting your information, but great topic. I needs to spend some time learning more or understanding more. Thanks for magnificent information I was looking for this information for my mission. whoah this weblog is excellent i love reading your articles. Keep up the great paintings! You realize, a lot of individuals are searching round for this info, you can help them greatly. Today, taking into consideration the fast way of living that everyone is having, credit cards get this amazing demand throughout the economy. Persons throughout every discipline are using credit card and people who aren’t using the card have lined up to apply for just one. Thanks for expressing your ideas in credit cards. Hey there, You’ve done a great job. I’ll definitely digg it and personally recommend to my friends. I am confident they will be benefited from this site. I have learn a few just right stuff here. Definitely worth bookmarking for revisiting. I surprise how much effort you set to make one of these wonderful informative website. Iâ€™d ought to seek advice from you here. Which is not something I do! I love reading an article that could make individuals feel. Also, numerous thanks permitting me to comment! Thank you for sharing superb informations. Your website is very cool. I am impressed by the details that you¡¦ve on this blog. It reveals how nicely you perceive this subject. Bookmarked this web page, will come back for more articles. You, my pal, ROCK! I found simply the info I already searched everywhere and just couldn’t come across. What an ideal website. I¡¦ve learn some just right stuff here. Definitely worth bookmarking for revisiting. I surprise how so much effort you put to make such a magnificent informative web site. Thank you a bunch for sharing this with all folks you really recognize what you’re talking about! Bookmarked. Kindly additionally visit my web site =). We can have a hyperlink trade arrangement between us! Hi, i think that i saw you visited my blog so i came to “return the favor”.I am attempting to find things to enhance my website!I suppose its ok to use some of your ideas!! wonderful issues altogether, you simply won a new reader. What may you suggest about your publish that you just made a few days in the past? Any certain? I keep listening to the news talk about receiving boundless online grant applications so I have been looking around for the best site to get one. Could you advise me please, where could i find some? naturally like your web-site however you have to test the spelling on several of your posts. Many of them are rife with spelling problems and I find it very troublesome to inform the truth nevertheless I will definitely come again again. Great post. I was checking constantly this blog and I am impressed! Very useful information specially the last part I care for such information a lot. I was looking for this particular info for a very long time. Thank you and best of luck. I have learn some just right stuff here. Definitely worth bookmarking for revisiting. I wonder how a lot effort you put to create this sort of wonderful informative web site. Thank you a bunch for sharing this with all of us you really recognise what you are talking about! Bookmarked. Kindly also visit my web site =). We will have a link change contract between us! Hiya, I’m really glad I have found this information. Nowadays bloggers publish just about gossips and net and this is actually annoying. A good blog with exciting content, this is what I need. Thank you for keeping this website, I’ll be visiting it. Do you do newsletters? Can’t find it. Hi my family member! I want to say that this post is awesome, nice written and come with approximately all significant infos. I¡¦d like to look extra posts like this . hello!,I like your writing so much! share we keep in touch extra about your article on AOL? I need an expert on this space to unravel my problem. May be that is you! Taking a look ahead to see you. Thanks a lot for giving everyone a very brilliant opportunity to read in detail from this web site. It’s usually so good plus stuffed with amusement for me personally and my office acquaintances to search your web site particularly three times per week to read the newest secrets you have. And of course, I’m usually astounded with the exceptional suggestions served by you. Certain 2 ideas in this post are definitely the finest we have had. I and my pals came looking at the best information on your web site and all of a sudden developed an awful suspicion I had not thanked the site owner for those strategies. All the women are actually consequently excited to read through them and now have simply been having fun with those things. Appreciation for actually being so considerate and also for finding such excellent subject matter millions of individuals are really eager to understand about. My very own honest apologies for not saying thanks to you earlier. Well I really liked studying it. This subject offered by you is very useful for correct planning. Helpful information. Fortunate me I found your site accidentally, and I’m shocked why this coincidence didn’t happened earlier! I bookmarked it. I’m really impressed with your writing skills and also with the layout on your weblog. Is this a paid theme or did you modify it yourself? Either way keep up the excellent quality writing, it is rare to see a nice blog like this one nowadays..
Hello there. I found your web site by the use of Google while looking for a related matter, your website came up. It appears to be good. I have bookmarked it in my google bookmarks to visit then. Hello there. I discovered your website by means of Google even as searching for a related topic, your web site came up. It looks great. I have bookmarked it in my google bookmarks to come back then. naturally like your website however you have to take a look at the spelling on several of your posts. A number of them are rife with spelling problems and I to find it very troublesome to tell the reality however I’ll definitely come back again. Hiya, I’m really glad I have found this info. Nowadays bloggers publish only about gossip and net stuff and this is actually frustrating. A good blog with exciting content, this is what I need. Thank you for making this web-site, and I will be visiting again. Do you do newsletters by email? Hi there, simply was aware of your blog via Google, and found that it is truly informative. I am going to watch out for brussels. I’ll be grateful for those who proceed this in future. Many people will probably be benefited out of your writing. Cheers! Hi there. I discovered your site by way of Google even as searching for a similar subject, your site got here up. It looks great. I’ve bookmarked it in my google bookmarks to visit then. Gaming pcâ€™s arenâ€™t as difficult as you might possibly believe, and creating your quite own gaming pc is not as tricky as a whole lot of folks would make you consider. Because you by now have a distinct software in head when constructing your individual gaming machine, you’ll find truly only three main elements you have to have to worry about, and every small thing else is truly secondary: the processor, video clip card, and RAM. Hi there, just became aware of your blog through Google, and found that it is truly informative. I’m going to watch out for brussels. I will appreciate if you continue this in future. Many people will be benefited from your writing. Cheers! I wanted to compose a simple word in order to say thanks to you for some of the precious ways you are giving here. My extensive internet look up has finally been recognized with brilliant facts and strategies to write about with my friends and family. I would admit that most of us website visitors are unquestionably fortunate to dwell in a fine site with so many special people with valuable concepts. I feel rather grateful to have used your web pages and look forward to many more awesome moments reading here. Thanks a lot once again for all the details. I cling on to listening to the news bulletin talk about getting boundless online grant applications so I have been looking around for the finest site to get one. Could you advise me please, where could i get some? hello!,I love your writing so a lot! percentage we communicate extra approximately your article on AOL? I require a specialist on this area to unravel my problem. May be that is you! Taking a look forward to look you. Hey there. I discovered your blog by way of Google even as searching for a related subject, your website came up. It seems to be great. I have bookmarked it in my google bookmarks to come back then. Hey there. I discovered your website by way of Google while searching for a comparable matter, your website came up. It appears to be great. I have bookmarked it in my google bookmarks to come back then. Hiya, I’m really glad I’ve found this information. Today bloggers publish only about gossip and net stuff and this is actually annoying. A good site with interesting content, this is what I need. Thanks for making this web-site, and I will be visiting again. Do you do newsletters by email? IÂ¡Â¦ve read several good stuff here. Surely value bookmarking for revisiting. I surprise how considerably effort you put to create one of these outstanding informative website. Hello there. I discovered your site by means of Google at the same time as looking for a similar subject, your website came up. It appears great. I’ve bookmarked it in my google bookmarks to visit then. I like this site it’s a master piece! Glad I found this on google. Found your weblog and decided to have a study on it, not what I normally do, but this blog is wonderful. Awesome to see a website thatâ€™s not spammed, and really makes some sense. Anyway, wonderful write up. I just could not go away your internet site before suggesting that I incredibly enjoyed the usual info a person supply to your guests? Is going to be back ceaselessly to be able to inspect new posts. I came to the exact conclusion as nicely some time ago. Great write-up and I will likely be confident to look back later for much more news. Hiya, I’m really glad I’ve found this info. Today bloggers publish only about gossip and internet stuff and this is really frustrating. A good web site with exciting content, this is what I need. Thank you for making this site, and I will be visiting again. Do you do newsletters by email? Hiya, I am really glad I’ve found this info. Nowadays bloggers publish just about gossip and web stuff and this is actually frustrating. A good web site with interesting content, that is what I need. Thank you for making this web-site, and I will be visiting again. Do you do newsletters by email? Hey there. I discovered your web site by the use of Google while looking for a similar matter, your web site came up. It appears great. I have bookmarked it in my google bookmarks to come back then. Hiya, I am really glad I have found this information. Today bloggers publish just about gossip and web stuff and this is really annoying. A good blog with exciting content, this is what I need. Thank you for making this site, and I’ll be visiting again. Do you do newsletters by email? Hey there. I discovered your site by the use of Google at the same time as looking for a similar matter, your web site got here up. It appears great. I’ve bookmarked it in my google bookmarks to visit then. I have been checking out some of your posts and i must say clever stuff. I will surely bookmark your website. Hiya, I’m really glad I’ve found this information. Nowadays bloggers publish only about gossip and internet stuff and this is actually irritating. A good web site with interesting content, this is what I need. Thank you for making this website, and I’ll be visiting again. Do you do newsletters by email? Hiya, I am really glad I have found this information. Today bloggers publish just about gossip and internet stuff and this is really frustrating. A good blog with exciting content, this is what I need. Thank you for making this website, and I’ll be visiting again. Do you do newsletters by email? I have to point out my respect for your kindness giving support to people who really want help with this important idea. Your personal dedication to getting the solution all-around appeared to be surprisingly practical and have truly empowered women much like me to realize their ambitions. Your own informative guideline entails much a person like me and a whole lot more to my peers. Regards; from each one of us. Hello, Neat post. There’s a problem with your site in internet explorer, could check this¡K IE nonetheless is the marketplace leader and a huge part of folks will omit your excellent writing due to this problem. We’re a group of volunteers and starting a new scheme in our community. Your site offered us with valuable info to work on. You’ve done an impressive job and our entire community will be grateful to you. I think other web site proprietors should take this web site as an model, very clean and great user friendly style and design, as well as the content. You are an expert in this topic! whoah this blog is great i love reading your posts. Stay up the great work! You realize, a lot of individuals are searching around for this info, you could aid them greatly. Very nice post. I just stumbled upon your blog and wanted to say that I have truly enjoyed browsing your blog posts. After all I’ll be subscribing to your rss feed and I hope you write again very soon! There is perceptibly a bundle to identify about this. I think you made various nice points in features also. Hello.This post was really remarkable, especially since I was investigating for thoughts on this issue last Saturday. Hi there, You have done a great job. I will certainly digg it and personally suggest to my friends. I am sure they’ll be benefited from this web site. I intended to create you the very little remark to help thank you once again about the awesome tricks you’ve shared on this page. This has been really wonderfully open-handed of people like you to offer extensively precisely what a lot of people would have distributed as an e book to help make some money on their own, notably since you might have done it if you ever wanted. The smart ideas likewise acted to be a great way to fully grasp that other individuals have similar desire similar to mine to know a lot more concerning this issue. I know there are millions of more enjoyable situations in the future for individuals that take a look at your site. Generally I don’t read post on blogs, but I would like to say that this write-up very pressured me to check out and do it! Your writing taste has been surprised me. Thanks, quite great article. Magnificent goods from you, man. I’ve understand your stuff previous to and you’re just too fantastic. I really like what you have acquired here, really like what you are stating and the way in which you say it. You make it enjoyable and you still care for to keep it smart. I can not wait to read far more from you. This is really a wonderful web site. You completed some nice points there. I did a search on the subject matter and found most persons will have the same opinion with your blog. Thanks for sharing superb informations. Your website is so cool. I’m impressed by the details that you have on this website. It reveals how nicely you understand this subject. Bookmarked this web page, will come back for more articles. You, my friend, ROCK! I found just the information I already searched all over the place and just couldn’t come across. What an ideal website. Wonderful goods from you, man. I’ve understand your stuff previous to and you’re just too great. I actually like what you have acquired here, certainly like what you are saying and the way in which you say it. You make it entertaining and you still care for to keep it smart. I can not wait to read far more from you. This is really a terrific website. I keep listening to the reports speak about receiving boundless online grant applications so I have been looking around for the top site to get one. Could you advise me please, where could i get some? I’m also commenting to make you be aware of what a fabulous experience my cousin’s girl developed checking yuor web blog. She figured out too many issues, most notably what it’s like to have an awesome giving heart to make men and women completely know selected impossible subject areas. You undoubtedly did more than readers’ expectations. Thank you for coming up with the great, healthy, informative as well as unique guidance on the topic to Emily. It¡¦s actually a great and useful piece of information. I am happy that you shared this useful info with us. Please keep us up to date like this. Thank you for sharing. I keep listening to the news update talk about getting free online grant applications so I have been looking around for the most excellent site to get one. Could you advise me please, where could i acquire some? Thanks so much for providing individuals with a very breathtaking chance to read from this web site. It is often so pleasurable plus packed with a lot of fun for me personally and my office peers to search your site no less than thrice a week to study the latest tips you have got. And definitely, I’m also at all times motivated with your effective principles you give. Some 4 ideas in this posting are unequivocally the most impressive I have ever had. great issues altogether, you simply won a emblem new reader. What may you suggest in regards to your publish that you simply made a few days in the past? Any certain? Thank you so much for providing individuals with a very breathtaking opportunity to discover important secrets from here. It can be so nice and as well , jam-packed with a great time for me personally and my office acquaintances to search your website at minimum thrice in one week to find out the latest guidance you will have. And of course, I am always fulfilled with your sensational principles served by you. Certain 1 facts in this post are in fact the most effective we’ve ever had. You made some clear points there. I did a search on the issue and found most individuals will consent with your site. I have learn a few just right stuff here. Certainly worth bookmarking for revisiting. I wonder how a lot effort you place to create this sort of great informative web site. Hi there, You have done a great job. I’ll certainly digg it and personally suggest to my friends. I’m sure they will be benefited from this site. you are in point of fact a just right webmaster. The site loading pace is incredible. It kind of feels that you’re doing any unique trick. In addition, The contents are masterwork. you’ve performed a great job on this topic! It is appropriate time to make some plans for the future and it’s time to be happy. I’ve read this post and if I could I wish to suggest you some interesting things or tips. Maybe you could write next articles referring to this article. I wish to read more things about it! Incredible! This blog looks exactly like my old one! It’s on a completely different topic but it has pretty much the same page layout and design. Excellent choice of colors! Well I really enjoyed reading it. This post offered by you is very practical for good planning. It is really a nice and useful piece of info. I am glad that you shared this helpful info with us. Please keep us informed like this. Thanks for sharing. I have to express some thanks to the writer for bailing me out of such a incident. Because of surfing around throughout the world wide web and finding basics which are not productive, I assumed my life was over. Being alive without the solutions to the issues you have resolved by means of your entire report is a serious case, as well as those which could have badly damaged my career if I had not discovered your site. Your actual natural talent and kindness in controlling the whole lot was helpful. I am not sure what I would’ve done if I had not come upon such a point like this. It’s possible to now look ahead to my future. Thanks so much for the specialized and sensible guide. I won’t think twice to recommend your web sites to anyone who ought to have care about this situation. I keep listening to the news speak about receiving boundless online grant applications so I have been looking around for the most excellent site to get one. Could you tell me please, where could i get some? Great amazing things here. I¡¦m very satisfied to see your article. Thank you a lot and i am looking forward to contact you. Will you please drop me a e-mail? whoah this blog is great i like studying your posts. Keep up the good work! You recognize, lots of people are looking around for this info, you could aid them greatly. Hey very nice website!! Guy .. Beautiful .. Superb .. I will bookmark your web site and take the feeds additionally¡KI’m happy to search out numerous useful information right here in the put up, we need develop extra strategies in this regard, thanks for sharing. . . . . . Fantastic website. Plenty of helpful information here. I am sending it to a few pals ans also sharing in delicious. And obviously, thank you in your effort! Wow! This could be one particular of the most beneficial blogs We have ever arrive across on this subject. Actually Great. I am also a specialist in this topic therefore I can understand your hard work. Wonderful goods from you, man. I’ve understand your stuff previous to and you are just extremely great. I really like what you have acquired here, really like what you’re saying and the way in which you say it. You make it enjoyable and you still care for to keep it wise. I can not wait to read much more from you. This is actually a tremendous website. hi!,I really like your writing so much! share we be in contact more about your post on AOL? I require an expert on this house to resolve my problem. May be that’s you! Taking a look forward to look you. I wanted to write you one little observation to help give many thanks once again regarding the extraordinary information you have featured on this page. It’s quite particularly open-handed of people like you to provide unhampered precisely what most of us would have sold as an e book to help with making some profit on their own, principally now that you might have tried it in the event you decided. These guidelines also acted as a good way to recognize that most people have the identical dream just as mine to know the truth much more with reference to this matter. I’m sure there are thousands of more enjoyable moments in the future for folks who check out your blog post. Hi there, I discovered your blog via Google even as looking for a similar topic, your website came up, it appears great. I’ve bookmarked it in my google bookmarks. There is noticeably a bundle to realize about this. I assume you created various good points in attributes also. Its like you read my mind! You appear to know so much about this, like you wrote the book in it or something. I think that you can do with some pics to drive the message home a little bit, but instead of that, this is great blog. A fantastic read. I’ll certainly be back. I was just looking for this info for some time. After 6 hours of continuous Googleing, finally I got it in your web site. I wonder what is the lack of Google strategy that don’t rank this kind of informative web sites in top of the list. Usually the top sites are full of garbage. Wow, marvelous blog layout! How long have you been blogging for? you make blogging look easy. The overall look of your site is fantastic, as well as the content! Hello, Neat post. There’s an issue with your site in web explorer, might check this¡K IE still is the marketplace chief and a huge section of folks will pass over your fantastic writing because of this problem. Hiya very nice web site!! Man .. Beautiful .. Wonderful .. I’ll bookmark your site and take the feeds also¡KI’m satisfied to find numerous useful info here in the submit, we want develop more techniques on this regard, thanks for sharing. . . . . .
Well I really enjoyed reading it. This information provided by you is very effective for good planning. I do agree with all the ideas you’ve presented in your post. They’re very convincing and will definitely work. Still, the posts are too short for newbies. Could you please extend them a little from next time? Thanks for the post. wonderful publish, very informative. I ponder why the other specialists of this sector do not understand this. You must proceed your writing. I’m confident, you’ve a great readers’ base already! Its like you read my mind! You appear to know so much about this, like you wrote the book in it or something. I think that you could do with some pics to drive the message home a little bit, but other than that, this is wonderful blog. A fantastic read. I will definitely be back. Nice post. I was checking constantly this blog and I’m impressed! Extremely useful information particularly the last part I care for such information a lot. I was seeking this certain information for a long time. Thank you and good luck. Hello there, I discovered your blog by means of Google even as looking for a similar matter, your web site got here up, it appears to be like great. I’ve bookmarked it in my google bookmarks. I do consider all of the concepts you have introduced for your post. They are really convincing and can definitely work. Still, the posts are too quick for novices. Could you please prolong them a little from subsequent time? Thanks for the post. I’m curious to discover out what weblog platform you are using? Iâ€™m having some minor security issues with my latest web site and Iâ€™d like to locate something a lot more risk-free. Do you have any solutions? Hiya, I’m really glad I’ve found this information. Nowadays bloggers publish only about gossip and internet stuff and this is actually irritating. A good site with exciting content, this is what I need. Thank you for making this web-site, and I will be visiting again. Do you do newsletters by email? Hi there. I found your blog by the use of Google while looking for a comparable matter, your website came up. It appears to be great. I’ve bookmarked it in my google bookmarks to visit then. Hiya, I’m really glad I’ve found this info. Today bloggers publish only about gossip and internet stuff and this is actually frustrating. A good website with interesting content, this is what I need. Thank you for making this website, and I will be visiting again. Do you do newsletters by email? Thanks for some other informative site. The place else may just I get that kind of information written in such a perfect manner? I have a undertaking that I am just now operating on, and I have been at the look out for such info. You really make it seem so easy along with your presentation however I find this matter to be really one thing which I think I might by no means understand. It kind of feels too complex and very wide for me. I am having a look ahead to your subsequent submit, I will try to get the cling of it! One more thing. I do believe that there are many travel insurance web sites of trustworthy companies that allow you to enter your trip details and find you the insurance quotes. You can also purchase the actual international travel cover policy on the web by using your current credit card. Everything you need to do is usually to enter your own travel particulars and you can be aware of the plans side-by-side. Simply find the package that suits your finances and needs and after that use your credit card to buy it. Travel insurance on the web is a good way to search for a trustworthy company regarding international travel cover. Thanks for giving your ideas. fantastic post, very informative. I’m wondering why the other experts of this sector do not understand this. You should continue your writing. I am confident, you have a great readers’ base already! I do agree with all of the concepts you’ve introduced to your post. They’re really convincing and will certainly work. Nonetheless, the posts are too quick for beginners. May just you please prolong them a bit from next time? Thank you for the post. Hello there, I discovered your blog by way of Google at the same time as looking for a similar matter, your website came up, it looks great. I have bookmarked it in my google bookmarks. Good write-up, I¡¦m regular visitor of one¡¦s site, maintain up the nice operate, and It’s going to be a regular visitor for a long time. I have learn some excellent stuff here. Definitely price bookmarking for revisiting. I wonder how much effort you place to make this sort of wonderful informative web site. Wow, awesome blog structure! How lengthy have you been running a blog for? you make running a blog glance easy. The total look of your site is great, as well as the content! Hi there. I discovered your site by the use of Google even as looking for a similar matter, your website came up. It appears good. I have bookmarked it in my google bookmarks to come back then. I precisely desired to thank you very much all over again. I’m not certain what I would’ve achieved in the absence of the aspects shown by you over such a industry. Completely was a real fearsome scenario for me, however , encountering the skilled approach you managed it took me to weep for gladness. I’m grateful for this service and have high hopes you really know what an amazing job you are always getting into teaching many people by way of your blog. Most probably you haven’t met all of us. Hiya, I am really glad I have found this info. Nowadays bloggers publish just about gossip and net stuff and this is really annoying. A good site with exciting content, this is what I need. Thanks for making this web-site, and I will be visiting again. Do you do newsletters by email? Good day very nice blog!! Guy .. Excellent .. Wonderful .. I’ll bookmark your website and take the feeds additionally¡KI am satisfied to seek out a lot of useful information right here in the publish, we want work out extra strategies in this regard, thank you for sharing. . . . . .
Good ¡V I should definitely pronounce, impressed with your site. I had no trouble navigating through all tabs as well as related information ended up being truly easy to do to access. I recently found what I hoped for before you know it in the least. Reasonably unusual. Is likely to appreciate it for those who add forums or something, site theme . a tones way for your client to communicate. Nice task..
My spouse and i got joyful that Peter managed to finish off his investigation from your ideas he got through the site. It is now and again perplexing to simply choose to be making a gift of things that men and women could have been trying to sell. So we fully grasp we have the website owner to appreciate for that. These illustrations you have made, the easy blog navigation, the friendships your site make it easier to foster – it’s got many awesome, and it is helping our son and the family reason why the theme is exciting, and that’s unbelievably mandatory. Thank you for all! Hiya, I’m really glad I have found this information. Nowadays bloggers publish only about gossip and net stuff and this is actually annoying. A good web site with exciting content, that is what I need. Thank you for making this web-site, and I will be visiting again. Do you do newsletters by email? Good web site! I really love how it is easy on my eyes and the data are well written. I’m wondering how I might be notified when a new post has been made. I’ve subscribed to your RSS which must do the trick! Have a nice day! Hiya, I’m really glad I’ve found this info. Nowadays bloggers publish just about gossip and net stuff and this is really annoying. A good website with exciting content, this is what I need. Thanks for making this web-site, and I will be visiting again. Do you do newsletters by email? Usually I don’t learn post on blogs, however I would like to say that this write-up very pressured me to try and do so! Your writing style has been surprised me. Thank you, quite nice post. Good day very nice web site!! Guy .. Beautiful .. Wonderful .. I’ll bookmark your web site and take the feeds also¡KI’m satisfied to search out numerous helpful information here within the publish, we need develop extra techniques in this regard, thank you for sharing. . . . . . Thanks for all your effort on this web page. My mother enjoys doing research and it is obvious why. A lot of people hear all of the compelling method you make efficient thoughts on this blog and increase contribution from other people on the idea and our favorite simple princess has always been discovering a whole lot. Take pleasure in the rest of the new year. Your conducting a fabulous job. My husband and i got now excited Jordan managed to conclude his studies using the ideas he grabbed from your very own web page. It is now and again perplexing to simply find yourself giving freely tactics a number of people may have been trying to sell. So we do know we now have you to thank for that. All of the illustrations you made, the straightforward blog navigation, the friendships you aid to create – it’s got many remarkable, and it’s really assisting our son and us do think the subject is enjoyable, and that is incredibly serious. Thank you for everything! Hiya, I’m really glad I have found this info. Today bloggers publish just about gossip and internet stuff and this is actually irritating. A good site with interesting content, this is what I need. Thank you for making this site, and I will be visiting again. Do you do newsletters by email? Hi there. I discovered your web site via Google while looking for a related topic, your website came up. It appears good. I’ve bookmarked it in my google bookmarks to visit then. Hello there. I discovered your site by way of Google at the same time as looking for a comparable topic, your web site came up. It seems good. I’ve bookmarked it in my google bookmarks to come back then. Hi my family member! I wish to say that this post is awesome, great written and include approximately all vital infos. I would like to peer more posts like this . I would like to thnkx for the efforts you’ve put in writing this site. I am hoping the same high-grade blog post from you in the upcoming as well. Actually your creative writing skills has encouraged me to get my own website now. Actually the blogging is spreading its wings rapidly. Your write up is a good example of it. Pretty section of content. I just stumbled upon your web site and in accession capital to assert that I get in fact enjoyed account your blog posts. Anyway I’ll be subscribing to your augment and even I achievement you access consistently fast. I am glad for writing to make you be aware of of the outstanding encounter my friend’s girl developed reading yuor web blog. She noticed lots of details, with the inclusion of how it is like to possess an excellent giving mindset to get many more smoothly fully grasp some hard to do issues. You truly did more than her desires. Thank you for delivering those beneficial, healthy, educational and unique tips on this topic to Ethel. Good web site! I truly love how it is easy on my eyes and the data are well written. I am wondering how I could be notified whenever a new post has been made. I’ve subscribed to your feed which must do the trick! Have a nice day! Thanks for every one of your hard work on this web site. My daughter really loves conducting research and it’s really obvious why. Most of us know all of the compelling tactic you render powerful information on your web blog and even improve participation from people on this idea and our daughter has always been learning a whole lot. Take pleasure in the rest of the new year. You’re conducting a superb job. Hello.This post was extremely remarkable, especially because I was looking for thoughts on this matter last Saturday. I am extremely inspired together with your writing skills and also with the format to your weblog. Is this a paid topic or did you modify it yourself? Anyway keep up the excellent high quality writing, it is uncommon to see a great blog like this one today..
You really make it appear really easy together with your presentation however I to find this topic to be really something that I feel I’d never understand. It kind of feels too complicated and extremely extensive for me. I’m having a look ahead for your subsequent post, I¡¦ll try to get the grasp of it! Thank you for sharing excellent informations. Your web site is very cool. I am impressed by the details that you¡¦ve on this blog. It reveals how nicely you understand this subject. Bookmarked this web page, will come back for extra articles. You, my pal, ROCK! I found just the info I already searched all over the place and simply couldn’t come across. What a perfect website. I precisely wanted to thank you very much once more. I’m not certain the things I could possibly have used without the advice provided by you concerning such situation. It previously was a real fearsome case in my circumstances, but being able to view a professional manner you treated it made me to cry with joy. I will be grateful for your service and even believe you realize what a powerful job you are always putting in training others through your websites. I am sure you’ve never come across any of us. Thank you a bunch for sharing this with all of us you really recognise what you are talking about! Bookmarked. Kindly also consult with my web site =). We can have a hyperlink alternate contract between us! Thanks for any other fantastic article. Where else may anybody get that type of information in such a perfect method of writing? I’ve a presentation next week, and I am on the search for such information. Just want to say your article is as surprising. The clearness in your post is just nice and i could assume you’re an expert on this subject. Fine with your permission allow me to grab your feed to keep updated with forthcoming post. Thanks a million and please keep up the rewarding work. I do trust all of the ideas you’ve presented on your post. They are really convincing and can definitely work. Nonetheless, the posts are too short for novices. Could you please extend them a bit from next time? Thank you for the post. I want to express thanks to the writer just for rescuing me from this type of scenario. Just after scouting through the online world and coming across notions that were not powerful, I was thinking my entire life was done. Living minus the solutions to the problems you’ve fixed all through your entire article is a serious case, and the ones that could have badly damaged my entire career if I had not encountered your web page. Your primary expertise and kindness in controlling every part was priceless. I’m not sure what I would have done if I hadn’t come upon such a stuff like this. I can at this point look ahead to my future. Thanks for your time very much for this reliable and amazing guide. I won’t hesitate to propose your blog to anybody who needs to have guide about this issue. I keep listening to the newscast lecture about getting free online grant applications so I have been looking around for the most excellent site to get one. Could you advise me please, where could i find some? Thanks a bunch for sharing this with all of us you actually realize what you’re speaking about! Bookmarked. Kindly also consult with my site =). We will have a hyperlink trade contract among us! Great amazing issues here. I¡¦m very glad to see your article. Thanks a lot and i am taking a look forward to touch you. Will you please drop me a e-mail? I do accept as true with all the ideas you have presented in your post. They are really convincing and will certainly work. Nonetheless, the posts are too brief for starters. May you please extend them a little from next time? Thank you for the post. A person essentially assist to make severely articles I might state. That is the very first time I frequented your website page and up to now? I surprised with the analysis you made to make this actual submit extraordinary. Great process! I’m looking for clothes and style ideas in a reasonable prices for a girl over 25… Anyone know any good sites or sites?.. Seems like everything I find can be either aimed toward teens or is insanely expensive fashion… Thanks!. I am just trying to see how can you avoid the content from being eliminated on a youtube video due to copyright laws. I really simply want to see what material can you use so that youtube will not take away the content. Like with music, in the event you use music from just like a CD rather than downloading it from like itunes? Can you produce any suggestions?. Hello there, You’ve done an excellent job. I’ll certainly digg it and personally recommend to my friends. I am confident they will be benefited from this web site. Thank you, I have recently been looking for info about this topic for ages and yours is the best I have discovered so far. But, what about the conclusion? Are you positive in regards to the source? whoah this weblog is wonderful i really like studying your articles. Stay up the good work! You know, a lot of persons are looking around for this info, you can aid them greatly. Can you really copy and paste news articles intended for my blog page or can be that copyright infringement? Does WordPress conserve all blogs to only a single file? In the event that so , what file is it? Hello there. I found your site via Google even as searching for a related matter, your website came up. It appears good. I have bookmarked it in my google bookmarks to come back then. Hiya, I am really glad I have found this information. Nowadays bloggers publish only about gossip and web stuff and this is actually frustrating. A good blog with exciting content, this is what I need. Thanks for making this site, and I’ll be visiting again. Do you do newsletters by email? You completed some fine points there. I did a search on the matter and found most people will go along with with your blog. Magnificent web site. A lot of helpful info here. I am sending it to some friends ans also sharing in delicious. And certainly, thank you for your sweat! I have been exploring for a bit for any high-quality articles or weblog posts on this sort of space . Exploring in Yahoo I ultimately stumbled upon this website. Reading this info So i¡¦m happy to express that I have an incredibly good uncanny feeling I came upon just what I needed. I most no doubt will make certain to do not fail to remember this website and give it a look on a continuing basis. I would like to thnkx for the efforts you have put in writing this blog. I am hoping the same high-grade web site post from you in the upcoming as well. In fact your creative writing abilities has inspired me to get my own site now. Really the blogging is spreading its wings quickly. Your write up is a great example of it. Just wish to say your article is as amazing. The clearness in your post is just excellent and i could assume you are an expert on this subject. Well with your permission let me to grab your feed to keep updated with forthcoming post. Thanks a million and please carry on the rewarding work. Hiya, I am really glad I have found this information. Today bloggers publish only about gossip and net stuff and this is actually frustrating. A good website with exciting content, this is what I need. Thank you for making this site, and I will be visiting again. Do you do newsletters by email? I have learn several good stuff here. Certainly price bookmarking for revisiting. I wonder how so much effort you put to make this kind of great informative site. wonderful points altogether, you simply won a logo new reader. What might you recommend in regards to your put up that you just made some days ago? Any positive? Excellent post. I was checking constantly this blog and I’m impressed! Very useful info specifically the last part I care for such info a lot. I was looking for this certain information for a very long time. Thank you and best of luck. Wow, awesome weblog layout! How lengthy have you ever been blogging for? you made running a blog look easy. The full glance of your website is great, let alone the content material! Thanks for any other informative web site. The place else may just I get that kind of information written in such an ideal method? I’ve a venture that I’m simply now operating on, and I have been at the look out for such info. Hello, Neat post. There is an issue together with your web site in internet explorer, could check this¡K IE nonetheless is the marketplace leader and a large portion of other people will leave out your fantastic writing because of this problem. Hello there, I discovered your website by the use of Google even as looking for a similar subject, your site came up, it seems good. I have bookmarked it in my google bookmarks. Hiya, I am really glad I’ve found this information. Nowadays bloggers publish just about gossip and internet stuff and this is really irritating. A good website with interesting content, this is what I need. Thanks for making this web-site, and I will be visiting again. Do you do newsletters by email? Thank you for sharing superb informations. Your web site is very cool. I’m impressed by the details that you¡¦ve on this blog. It reveals how nicely you perceive this subject. Bookmarked this web page, will come back for extra articles. You, my pal, ROCK! I found simply the information I already searched all over the place and just couldn’t come across. What a perfect web-site. I want to express some appreciation to this writer just for bailing me out of such a instance. Right after searching throughout the online world and coming across ways that were not helpful, I figured my entire life was over. Existing devoid of the solutions to the issues you’ve sorted out by means of this review is a serious case, and ones which could have negatively affected my entire career if I had not noticed the website. Your good understanding and kindness in handling all things was crucial. I’m not sure what I would’ve done if I had not encountered such a solution like this. I can also at this time relish my future. Thanks a lot very much for this high quality and result oriented guide. I will not think twice to refer the sites to anyone who should get direction about this topic. I’ve been browsing online more than 3 hours nowadays, but I by no means found any interesting article like yours. It is beautiful value sufficient for me. In my opinion, if all site owners and bloggers made just right content as you probably did, the net might be a lot more helpful than ever before. I will right away grasp your rss as I can’t to find your email subscription hyperlink or newsletter service. Do you’ve any? Please permit me understand so that I may subscribe. Thanks. I am also commenting to let you be aware of what a notable discovery our child undergone reading through your web page. She noticed a lot of details, with the inclusion of what it’s like to have an awesome helping character to let a number of people quite simply learn about various tortuous topics. You really did more than our expectations. Thank you for producing these good, dependable, educational not to mention unique thoughts on the topic to Mary. hi!,I like your writing so much! percentage we keep in touch extra about your article on AOL? I need an expert on this area to solve my problem. Maybe that is you! Looking forward to see you. A lot of thanks for all your valuable work on this blog. My mom take interest in going through research and it’s easy to understand why. Most people know all concerning the powerful medium you give sensible information via the website and in addition recommend response from other individuals about this point and our own princess is certainly becoming educated so much. Have fun with the remaining portion of the year. You’re the one doing a superb job. I have been exploring for a little bit for any high quality articles or weblog posts on this sort of house . Exploring in Yahoo I at last stumbled upon this site. Studying this information So i¡¦m happy to exhibit that I’ve an incredibly just right uncanny feeling I discovered exactly what I needed. I so much surely will make certain to don¡¦t put out of your mind this site and give it a look on a constant basis. Thanks for another informative website. Where else may I get that kind of information written in such a perfect way? I’ve a project that I’m simply now working on, and I’ve been on the look out for such info. great post, very informative. I ponder why the other experts of this sector do not understand this. You must proceed your writing. I’m confident, you have a great readers’ base already! Hello, Neat post. There’s a problem along with your website in web explorer, may check this¡K IE still is the marketplace chief and a large part of people will leave out your great writing because of this problem. Very nice post. I just stumbled upon your blog and wanted to say that I have truly enjoyed surfing around your blog posts. In any case I’ll be subscribing to your feed and I hope you write again very soon! Definitely, what a fantastic website and instructive posts, I definitely will bookmark your site.Best Regards! I am just writing to let you know what a beneficial experience my cousin’s princess gained reading your web page. She noticed a good number of details, which include how it is like to have a marvelous giving character to have the rest with no trouble have an understanding of a number of impossible matters. You truly surpassed my expected results. I appreciate you for presenting the great, healthy, edifying not to mention fun tips on your topic to Gloria. Good blog! I truly love how it is simple on my eyes and the data are well written. I am wondering how I could be notified whenever a new post has been made. I’ve subscribed to your feed which must do the trick! Have a great day! Magnificent goods from you, man. I’ve understand your stuff previous to and you are just extremely magnificent. I really like what you have acquired here, really like what you’re stating and the way in which you say it. You make it entertaining and you still take care of to keep it wise. I can’t wait to read much more from you. This is actually a wonderful website. Nice post. I was checking constantly this blog and I am impressed! Very useful info specially the last part I care for such info a lot. I was seeking this certain info for a long time. Thank you and good luck. I’ve been browsing online greater than 3 hours nowadays, yet I by no means discovered any attention-grabbing article like yours. It¡¦s beautiful price enough for me. Personally, if all website owners and bloggers made excellent content material as you probably did, the net will likely be a lot more helpful than ever before. Thank you for the sensible critique. Me & my neighbor were just preparing to do a little research on this. We got a grab a book from our area library but I think I learned more from this post. I’m very glad to see such magnificent information being shared freely out there. Hiya, I am really glad I have found this information. Today bloggers publish only about gossip and web stuff and this is really annoying. A good blog with interesting content, that’s what I need. Thanks for making this website, and I will be visiting again. Do you do newsletters by email? Hiya, I am really glad I have found this information. Today bloggers publish only about gossip and net stuff and this is really irritating. A good blog with interesting content, this is what I need. Thanks for making this site, and I will be visiting again. Do you do newsletters by email? Excellent goods from you, man. I’ve understand your stuff previous to and you are just extremely great. I actually like what you’ve acquired here, certainly like what you are saying and the way in which you say it. You make it enjoyable and you still care for to keep it wise. I cant wait to read far more from you. This is really a tremendous site. certainly like your web site but you need to check the spelling on several of your posts. Many of them are rife with spelling issues and I in finding it very bothersome to inform the truth on the other hand I¡¦ll certainly come back again. Whenever i begin a video call/ web cam/voice call on live messenger, skype, google talk, yahoo messenger, my computer totally freezes, and gives an echo. I have to restart it by hand. Sometimes it has a blue screen, and it restarts alone.. I are using Vista, and this scenario existed while i had XP on this pc. What is definitely wrong? Hardware problems? There is no virus discovered after i scanned the computer with Kaspersky..
Nice post. I used to be checking constantly this blog and I’m impressed! Very useful info particularly the ultimate phase I take care of such info a lot. I used to be looking for this certain information for a very lengthy time. Thanks and best of luck. You actually make it seem so easy with your presentation but I in finding this matter to be really one thing that I believe I would by no means understand. It sort of feels too complicated and very wide for me. I am taking a look ahead on your subsequent post, I will attempt to get the grasp of it! I am not sure where you are getting your info, but great topic. I must spend some time studying much more or figuring out more. Thanks for wonderful information I used to be looking for this info for my mission. Thanks for any other great article. The place else may just anybody get that type of information in such an ideal manner of writing? I’ve a presentation subsequent week, and I am at the search for such information. I¡¦ll immediately clutch your rss feed as I can’t in finding your email subscription hyperlink or newsletter service. Do you have any? Kindly permit me recognise in order that I could subscribe. Thanks. I am curious to find out what blog system you’re working with? I’m having some small security issues with my latest website and I’d like to find something more safe. Do you have any recommendations? Absolutely nothing much better than Bing obtaining us a excellent website related to what I was searching for. Hi there. I discovered your web site via Google while searching for a related matter, your website got here up. It seems to be good. I have bookmarked it in my google bookmarks to come back then. I have been exploring for a bit for any high quality articles or blog posts on this sort of area . Exploring in Yahoo I ultimately stumbled upon this website. Reading this info So i¡¦m glad to show that I’ve an incredibly good uncanny feeling I came upon exactly what I needed. I most certainly will make certain to don¡¦t fail to remember this website and provides it a glance regularly. It¡¦s really a great and helpful piece of info. I am satisfied that you just shared this useful info with us. Please stay us up to date like this. Thanks for sharing. Nice post. I was checking constantly this blog and I’m impressed! Extremely helpful info specially the last part I care for such information a lot. I was looking for this certain info for a very long time. Thank you and good luck. Hiya, I am really glad I’ve found this information. Nowadays bloggers publish only about gossip and internet stuff and this is really annoying. A good website with interesting content, this is what I need. Thank you for making this web site, and I’ll be visiting again. Do you do newsletters by email? We’re a group of volunteers and starting a new scheme in our community. Your web site offered us with valuable information to work on. You have done a formidable job and our whole community will be thankful to you. Hiya, I am really glad I’ve found this info. Nowadays bloggers publish only about gossip and internet stuff and this is actually irritating. A good blog with interesting content, this is what I need. Thanks for making this website, and I will be visiting again. Do you do newsletters by email? It’s perfect time to make some plans for the future and it is time to be happy. I have read this post and if I could I wish to suggest you few interesting things or tips. Maybe you can write next articles referring to this article. I wish to read more things about it! hello there and thank you for your information – I have definitely picked up anything new from right here. I did however expertise several technical issues using this website, as I experienced to reload the web site many times previous to I could get it to load correctly. I had been wondering if your web hosting is OK? Not that I’m complaining, but sluggish loading instances times will very frequently affect your placement in google and could damage your quality score if advertising and marketing with Adwords. Well I am adding this RSS to my email and could look out for a lot more of your respective fascinating content. Ensure that you update this again very soon..
wonderful issues altogether, you simply won a emblem new reader. What could you suggest about your publish that you just made a few days in the past? Any certain? There is noticeably a lot to identify about this. I suppose you made various good points in features also. What blog sites would be good for a small business in flower and gifts? I truly wanted to write a small message in order to express gratitude to you for some of the amazing ideas you are writing on this website. My incredibly long internet investigation has now been recognized with professional concept to write about with my good friends. I ‘d declare that many of us website visitors are very fortunate to exist in a superb website with so many wonderful professionals with valuable suggestions. I feel very much lucky to have discovered your entire webpages and look forward to some more awesome moments reading here. Thanks once more for all the details. Great tremendous issues here. I¡¦m very glad to peer your post. Thank you a lot and i’m having a look forward to contact you. Will you kindly drop me a e-mail? Hi there, You have done an excellent job. I’ll certainly digg it and personally suggest to my friends. I’m sure they’ll be benefited from this web site. Great remarkable issues here. I am very glad to look your article. Thanks so much and i’m having a look forward to contact you. Will you please drop me a e-mail? You completed several nice points there. I did a search on the subject matter and found the majority of folks will have the same opinion with your blog. Whats up very cool blog!! Man .. Excellent .. Superb .. I will bookmark your site and take the feeds also¡KI am satisfied to find numerous useful info right here in the put up, we’d like work out more strategies in this regard, thanks for sharing. . . . . .
Hello there. I discovered your web site by means of Google at the same time as looking for a comparable subject, your website got here up. It seems great. I’ve bookmarked it in my google bookmarks to come back then. I have to express some appreciation to you just for bailing me out of this particular issue. Right after looking out throughout the the web and finding recommendations which are not productive, I believed my entire life was well over. Existing without the presence of solutions to the difficulties you’ve sorted out by means of your post is a crucial case, as well as the kind that might have in a negative way affected my career if I had not encountered your web site. Your actual knowledge and kindness in maneuvering every aspect was very helpful. I’m not sure what I would have done if I hadn’t come upon such a thing like this. I can at this point look ahead to my future. Thank you so much for the professional and effective guide. I will not think twice to refer your web site to anyone who would like recommendations about this subject matter. Thank you for all your valuable effort on this site. Ellie enjoys going through investigations and it’s really obvious why. We all notice all of the compelling tactic you offer worthwhile strategies through this blog and therefore inspire response from other ones on this area and our simple princess is certainly discovering a lot. Enjoy the rest of the year. You are carrying out a good job. Tips on how to ban a person from a blog on blogspot? hey there and thank you for your information – I’ve definitely picked up something new from right here. I did however expertise some technical issues using this site, since I experienced to reload the web site many times previous to I could get it to load correctly. I had been wondering if your web hosting is OK? Not that I’m complaining, but slow loading instances times will sometimes affect your placement in google and can damage your quality score if ads and marketing with Adwords. Well I’m adding this RSS to my e-mail and can look out for much more of your respective fascinating content. Make sure you update this again very soon.. Excellent blog! Do you have any tips for aspiring writers? I’m hoping to start my own website soon but I’m a little lost on everything. Would you recommend starting with a free platform like WordPress or go for a paid option? There are so many choices out there that I’m completely overwhelmed .. Any recommendations? Bless you! Hi my friend! I want to say that this article is amazing, great written and come with approximately all significant infos. I would like to look more posts like this . Good post. I learn something much more challenging on different blogs everyday. It will always be stimulating to read content material from other writers and practice just a little something from their store. Iâ€™d prefer to use some with the content on my blog whether you donâ€™t mind. Natually Iâ€™ll give you a link on your web weblog. Thanks for sharing. hello!,I love your writing very much! share we keep up a correspondence more approximately your post on AOL? I need a specialist on this area to resolve my problem. May be that’s you! Taking a look forward to see you. I wish to show appreciation to this writer for rescuing me from this particular condition. As a result of looking out through the search engines and meeting ways which were not pleasant, I was thinking my life was well over. Being alive minus the answers to the problems you’ve resolved through the website is a crucial case, as well as the kind that could have badly affected my entire career if I had not come across your web page. The natural talent and kindness in dealing with all the stuff was crucial. I’m not sure what I would’ve done if I had not come across such a step like this. It’s possible to now relish my future. Thanks for your time very much for this impressive and sensible guide. I will not think twice to suggest your blog post to any individual who would need recommendations about this subject. How can i go about getting rid of articles that breach copyright? How do I start a blog page under a pen-name and maintain my anonymity. How can you then obtain regular visitors? Hello, i believe that i noticed you visited my website so i came to “go back the favor”.I am attempting to in finding things to enhance my website!I guess its good enough to make use of some of your concepts!! We want to start our own blog web page together upon blogspot, but I just considered us having our own individual google accounts. How can we start a blog page together where it’s going to be easier to get both people to connect to the internet besides simply using one person’s google accounts?. I am new to blog page subscriptions and I am looking meant for an easy audience that is certainly nice and structured that enables me view my blogs from personal homepage or has a little scrollbox that is usually always up on the side of the computer screen. I actually started to use bloglines but it is really unorganized with all the blog page names lined up on the side. Thanks a lot!. I must show some thanks to this writer for rescuing me from such a dilemma. Just after looking through the world-wide-web and finding advice which were not powerful, I was thinking my life was done. Living without the presence of answers to the difficulties you’ve resolved by means of your good review is a serious case, and ones that would have in a wrong way damaged my career if I had not noticed the website. Your personal mastery and kindness in playing with every aspect was vital. I don’t know what I would have done if I hadn’t discovered such a subject like this. I can also at this moment look ahead to my future. Thanks a lot so much for the skilled and result oriented guide. I will not hesitate to endorse your blog post to anybody who should receive guidelines about this subject. Exactly what is the best way to save documents to a blogspot blog? I have been absent for a while, but now I remember why I used to love this web site. Thanks , I¡¦ll try and check back more often. How frequently you update your web site? I have a Blogger blog that is connected to my personal website. The actual blog is connected off of the website. I would like to know if there’s a widget or something that I can put on my website’s website that will display my latest blog posts. Not really the whole post, but maybe only the headline and a link to go to my blog.. There are a lot of blogging sites dedicated to stars (ex. Perez Hilton), love, fashion, travel, and meals. But , how do I start certainly one of my own specialized?. The template We made doesn’t have any code in this about the navbar. Let me bring it back again. What code do I place in to show the Navbar in blogger?. Whats Taking place i’m new to this, I stumbled upon this I’ve found It absolutely helpful and it has helped me out loads. I’m hoping to contribute & help other users like its aided me. Good job. I am just commenting to make you understand of the excellent experience my wife’s daughter found checking yuor web blog. She picked up numerous pieces, most notably what it’s like to possess an excellent giving style to get the rest just know precisely specific specialized things. You truly did more than people’s expected results. Thank you for rendering the productive, trustworthy, informative and as well as unique tips on your topic to Sandra. Great ¡V I should certainly pronounce, impressed with your website. I had no trouble navigating through all tabs and related information ended up being truly easy to do to access. I recently found what I hoped for before you know it at all. Reasonably unusual. Is likely to appreciate it for those who add forums or something, site theme . a tones way for your client to communicate. Nice task..
fantastic issues altogether, you just received a new reader. What may you suggest in regards to your post that you simply made a few days in the past? Any certain? Pretty section of content. I just stumbled upon your website and in accession capital to assert that I get in fact enjoyed account your blog posts. Anyway I will be subscribing to your feeds and even I achievement you access consistently rapidly. Thanks for every other magnificent post. Where else may just anybody get that kind of info in such a perfect way of writing? I have a presentation subsequent week, and I’m at the look for such information. I keep listening to the news bulletin talk about getting free online grant applications so I have been looking around for the finest site to get one. Could you tell me please, where could i find some? Hiya, I am really glad I have found this info. Today bloggers publish just about gossip and net stuff and this is actually frustrating. A good site with interesting content, that’s what I need. Thanks for making this website, and I will be visiting again. Do you do newsletters by email? Can one turn into a partner online with copyright content on the page? Hiya, I am really glad I have found this information. Today bloggers publish just about gossip and web stuff and this is really annoying. A good web site with interesting content, this is what I need. Thanks for making this web site, and I’ll be visiting again. Do you do newsletters by email? Hi, I do think this is an excellent site. I stumbledupon it 😉 I may revisit once again since I book marked it. Money and freedom is the greatest way to change, may you be rich and continue to guide other people. Hiya, I am really glad I’ve found this info. Today bloggers publish only about gossip and internet stuff and this is actually annoying. A good website with exciting content, this is what I need. Thanks for making this web-site, and I’ll be visiting again. Do you do newsletters by email? Hi there. I discovered your website by means of Google at the same time as looking for a comparable matter, your site came up. It appears to be great. I have bookmarked it in my google bookmarks to come back then. I’m really inspired along with your writing abilities as neatly as with the structure to your blog. Is that this a paid subject or did you modify it yourself? Anyway stay up the excellent high quality writing, it is rare to peer a nice weblog like this one today..
Wow! Thank you! I constantly needed to write on my blog something like that. Can I take a part of your post to my blog? I¡¦ll right away grasp your rss as I can not in finding your email subscription link or e-newsletter service. Do you’ve any? Kindly let me know in order that I may just subscribe. Thanks. You could certainly see your skills in the work you write. The world hopes for even more passionate writers like you who aren’t afraid to mention how they believe. Always follow your heart. Very nice post. I just stumbled upon your weblog and wanted to say that I’ve really enjoyed browsing your blog posts. After all I’ll be subscribing to your feed and I hope you write again soon! There is evidently a bunch to know about this. I consider you made certain good points in features also. Very efficiently written story. It will be valuable to everyone who usess it, including myself. Keep doing what you are doing – looking forward to more posts. I’m still learning from you, but I’m trying to achieve my goals. I absolutely liked reading everything that is written on your site.Keep the stories coming. I liked it! Thank you a bunch for sharing this with all of us you actually know what you’re speaking approximately! Bookmarked. Please also talk over with my website =). We could have a link trade agreement among us! Hello there. I discovered your web site by way of Google while searching for a similar matter, your web site got here up. It appears to be good. I’ve bookmarked it in my google bookmarks to visit then. Thank you for some other wonderful article. Where else could anybody get that type of information in such a perfect manner of writing? I have a presentation subsequent week, and I’m at the search for such information. Hello There. I found your blog using msn. This is a very well written article. I will make sure to bookmark it and come back to read more of your useful information. Thanks for the post. I’ll definitely return. Hiya, I’m really glad I have found this information. Nowadays bloggers publish just about gossip and web stuff and this is actually frustrating. A good web site with exciting content, that is what I need. Thank you for making this web-site, and I’ll be visiting again. Do you do newsletters by email? I have viewed that wise real estate agents just about everywhere are Advertising and marketing. They are realizing that it’s more than simply placing a sign in the front yard. It’s really about building human relationships with these retailers who at some point will become buyers. So, while you give your time and efforts to encouraging these vendors go it alone – the “Law regarding Reciprocity” kicks in. Good blog post. Hi there. I found your web site by means of Google at the same time as searching for a comparable matter, your website got here up. It seems great. I’ve bookmarked it in my google bookmarks to visit then. Hello there. I found your website by way of Google at the same time as looking for a related topic, your site came up. It appears to be great. I have bookmarked it in my google bookmarks to visit then. Normally I do not read post on blogs, but I would like to say that this write-up very forced me to take a look at and do so! Your writing taste has been surprised me. Thanks, very nice article. Whats up very cool blog!! Man .. Beautiful .. Superb .. I will bookmark your blog and take the feeds also¡KI’m glad to find numerous useful information here in the put up, we’d like develop extra strategies in this regard, thanks for sharing. . . . . . I actually wanted to type a remark to be able to appreciate you for all of the superb guides you are giving at this site. My extensive internet look up has finally been recognized with reputable ideas to share with my friends and family. I would state that that most of us visitors are very much fortunate to dwell in a fine place with so many marvellous individuals with useful advice. I feel really blessed to have come across your entire weblog and look forward to really more exciting moments reading here. Thank you once more for a lot of things. Wow! Thank you! I continually needed to write on my blog something like that. Can I take a part of your post to my site? hey there and thank you for your info – I’ve definitely picked up anything new from right here. I did however expertise some technical issues using this web site, since I experienced to reload the web site a lot of times previous to I could get it to load correctly. I had been wondering if your web hosting is OK? Not that I am complaining, but sluggish loading instances times will often affect your placement in google and can damage your high quality score if advertising and marketing with Adwords. Anyway I am adding this RSS to my e-mail and can look out for much more of your respective fascinating content. Ensure that you update this again very soon..
Hiya, I am really glad I have found this info. Nowadays bloggers publish only about gossip and web stuff and this is actually irritating. A good site with exciting content, that is what I need. Thank you for making this web-site, and I will be visiting again. Do you do newsletters by email? Generally I do not learn article on blogs, however I wish to say that this write-up very pressured me to check out and do so! Your writing taste has been surprised me. Thank you, very nice post. Hey there. I discovered your website by way of Google while searching for a similar topic, your site got here up. It appears great. I have bookmarked it in my google bookmarks to come back then. I’m really loving the theme/design of your website. Do you ever run into any browser compatibility problems? A few of my blog visitors have complained about my site not working correctly in Explorer but looks great in Firefox. Do you have any tips to help fix this issue? Great tremendous issues here. I am very satisfied to peer your post. Thank you so much and i am looking forward to touch you. Will you kindly drop me a mail? You actually make it appear so easy with your presentation however I to find this matter to be really one thing which I believe I might by no means understand. It sort of feels too complicated and extremely wide for me. I’m looking forward to your next submit, I will try to get the cling of it! Hello there. I found your site by the use of Google while searching for a comparable matter, your site got here up. It seems great. I’ve bookmarked it in my google bookmarks to come back then. I would like to convey my respect for your generosity for folks who really need guidance on this issue. Your personal commitment to getting the solution all around appears to be wonderfully important and has all the time encouraged many people much like me to achieve their dreams. Your important tutorial denotes a great deal to me and additionally to my colleagues. Thanks a lot; from each one of us. Thank you for sharing superb informations. Your web site is very cool. I’m impressed by the details that you have on this site. It reveals how nicely you understand this subject. Bookmarked this web page, will come back for more articles. You, my friend, ROCK! I found just the info I already searched everywhere and just could not come across. What a perfect web-site. I will immediately take hold of your rss feed as I can’t find your e-mail subscription link or newsletter service. Do you have any? Please allow me realize so that I may just subscribe. Thanks. Fantastic site. Lots of helpful info here. I am sending it to some friends ans also sharing in delicious. And certainly, thank you on your effort! Pretty component to content. I simply stumbled upon your site and in accession capital to assert that I get actually enjoyed account your blog posts. Anyway I will be subscribing for your augment and even I success you get admission to persistently fast.